The Date and or Time Format in QuickTextPaste is a good feature to insert Date or Time in your quick text paste text about keyboard shortcut! Here is a list of possible Date and Time formats in Quick-Text-Paste at V. 2.41! See also: Working with date, time and calendar week in QuickTextPaste! 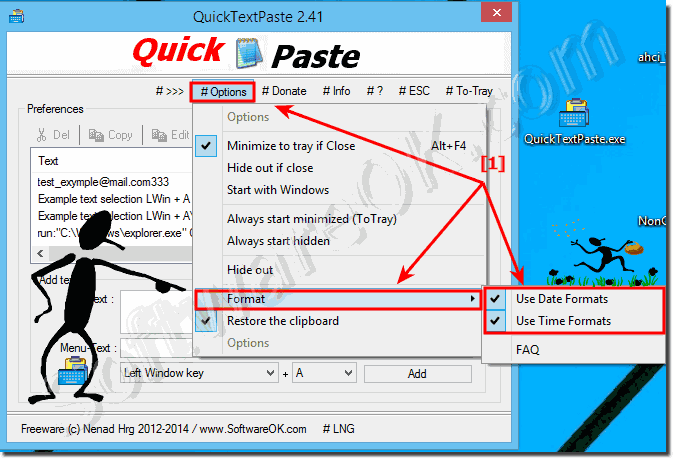 (Image-1) Date Time Format for Windows in Quick-Text-Paste! QuickTextPaste - FAQ-6: Date Time Format in QuickTextPaste!